A totem pole is topped by a leafy cabin in which a hare may be living. 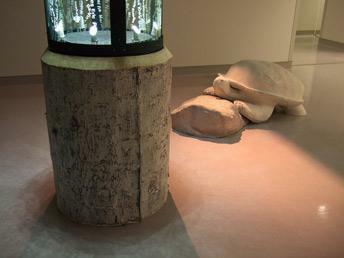 The artwork is made up of four components: a totem pole, a cabin, a tortoise and a hare. Each element carries its own story. The totem pole connects heaven and earth. The cabin, like a treehouse, is the perfect hiding place for any child. A strong and patient tortoise inhabits this place along with a nervous hare who is always ready to jump around. 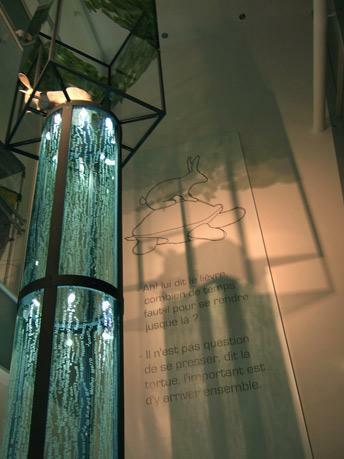 The names of 600 children who have been treated in this pavilion are engraved on the totem pole. Patience, vitality and fear; narratives of the various stories that parents and children will tell each other as they await treatment. Fear, patience, perseverance and the determination experienced by those affected by disease.